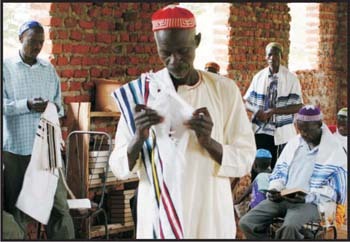 Did you know that there is a thriving community of almost a thousand African Jews living in Uganda? 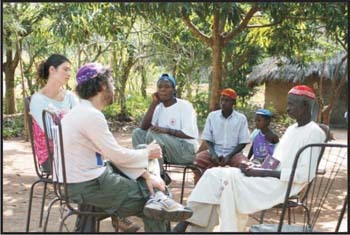 After spending an incredible seder night with them last year and staying with one of the families in their village, I set up Kippot for Hope - a non-profit initiative which aims to improve the community's living conditions by selling the handmade colourful kippot, beautifully crocheted by the women of the community. 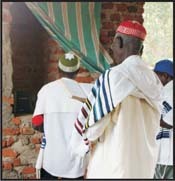 In the remote hills of eastern Uganda, in the shadow of Mount Elgon lives a small community of Africans who are also practising Jews. Their population currently stands at around 800 although prior to the persecutions of the Idi Amin regime their numbers exceeded 3,000. In 1919, a Christian Ugandan leader called Semei Kakungulu, decided that he felt a stronger connection to the Old Testament than the New. When he was told that that is the Book of the Jews, he proclaimed, "Then we will be Jewish". 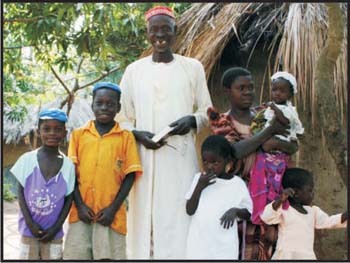 He declared his entire tribe to be Jewish and circumcised his sons and himself. Logo of Kippot (Yarmulkas) for Hope and various colorful Kippot (Yarmulkas). In the early 1920s the community was visited by an American Jew who stayed with them for six months. He taught them about the festivals, the calendar, and the laws of kashrut. He was also instrumental in the establishment of a school with the purpose of passing on Jewish knowledge and teaching skills. These people became known as The Abayudaya ("The People of Judaea"). However, during the persecution of the Idi Amin era almost 90% of this population was forced to convert to either Christianity or Islam. Approximately 300 members remained, committed to Judaism and worshipped in secret. Today there are almost 800 Jews of the Abaudaya, divided into six small communities spread across 100 kilometres in the east of Uganda. Two years ago, my wife, Genevieve and I moved from Melbourne to Uganda and last year we were invited to visit the Abayudaya community to share their Seder night with them. It was a long six-hour bus journey from Kampala but when we finally reached the community, we were greeted by small Ugandan children, the boys all wearing kippot (yarmulkas), with shouts of "Shalom, Shalom". As the sun set on the distant horizon in a stunning display of oranges and crimsons, the entire community of over 200 people made their way to the synagogue for the Seder. I'm not sure the women in my family would cope with having to make charoset for 200 people but the Abayudaya women did an incredible job of preparing not only charoset but also egg & salt water, and maror for everyone. Vast quantities of the traditional items were carried into the room in large plastic buckets and huge cooking pots. We had brought boxes of matzah which were meticulously divided into small bite size chunks so that every single member of the community could have a piece to go with their scoop of charoset. While we had bitter herbs in abundance there was very little kosher wine. Only two bottles were to be shared between the entire community. Wine is not something that the Abayudaya have the privilege of being able to drink regularly and generally only to mark special occasions. The first night of Seder is certainly one of those times. Not wanting anyone to miss out on sharing the wine it was mixed with a locally brewed alcohol (made from fermented bananas) before being poured out into plastic cups. A group of thirty or so children gathered at one end of the table to sing the Ma-nishtanah. After the their way to the synagogue for the Seder. A group of thirty or so children gathered at one end of the table to sing the Ma-nishtanah. After the first question was asked so beautifully the entire community joined in with the remaining three questions. The tune was identical to the one I have grown up with. The ten plagues and the dipping of the little fingers into our cups was carried out with incredible excitement by all. The elders in the community all sat at the back, allowing the children to be more involved. The elders are all in their 60s and, over time, have seen their community shrink by ninety percent. Their smiling faces made it clear to me that they were very happy with the enthusiasm of the children when it came to Jewish traditions. When the food finally came many of the children were asleep and were awoken by their mothers so not to miss a meal. Everyone was service a plate of typical Ugandan food - beans, plantain and some greens. After we'd all eaten, the young boys and girls took it upon themselves to stand up and sing all the traditional Seder songs. One of the older boys had an African drum which he beat with his hands in time with each song. After the third or fourth rendition of Had-Gadya the children moved onto other Jewish songs and prayers such as Moshiach, The Shema, Gesher Tzar Meod, Hineh Ma tov o Manayim and Ein Kelohaynu. For me, it was just incredible to see Africans singing songs that I have always associated with people from my own culture. The drinking and singing continued into the night. It was a truly magical experience. I happened to be sitting next to a young man called Yosef from one of the satellite communities. He told me how his small community was struggling. 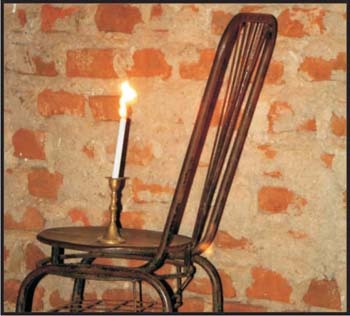 Their synagogue was a simple brick building, with no floor or windows and only a handful of books. Yosef's community hasn't received as much outside help as the central community has done over the years. A few weeks later Genevieve and I stayed with Yosef and his family, in their tiny village. 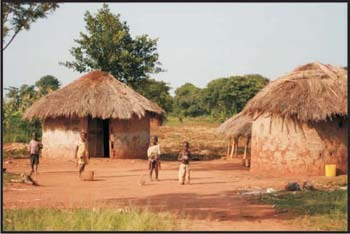 The families live in very basic mud and stick homes with no electricity or running water. They use primitive tin and wick kerosene burners for light at night - but can only afford two hours of oil per night. We shared their Shabbat meal - a simple plate of mashed plantain and beans. We brought some bread and wine along - luxuries they had never previously enjoyed. 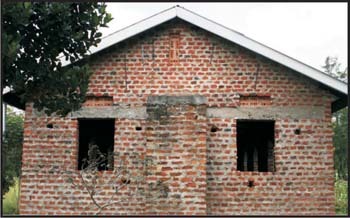 The next morning we were invited to their synagogue for the Shabbat service - a basic brick building with a few holes for windows. The floor was the earth and the congregation shared only a handful of siddurim between them. 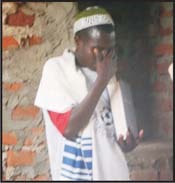 Religion is very important to the Abayudaya and they embrace their Judaism with real passion. Their hopes for glass windows and a solid floor in their synagogue was made apparent to me after the service when I chatted with the Rabbi and members of his congregation. 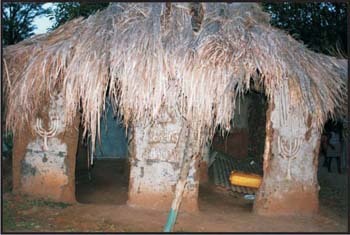 A typical Village Jewish home. I wanted to try and help this community realise their dream. But at the same time I wanted to contribute something towards health, agriculture and education programs for them as well. I purchased a hundred handmade, colourful wool kippot from Yosef's community and vowed to sell them in the UK and Australia, returning with the proceeds and helping them with their needs. Three months later I returned to the community with just over a thousand dollars worth of Ugandan Shillings. I discussed with the community committee how best to spend this money. I wanted to ensure that some of it could be used to generate more income for them, to enable them to become more self sufficient and less reliant on outside donations. We installed four new glass windows in the synagogue - on the side where the rains come in, often preventing them from praying on wet days. The rest of the money was spent ploughing a spare acre of land with a bull and an old wooden plough and planting 10,000 pineapple seeds. We hope that the sale of these pineapples will earn the community a few thousand dollars each year. We have discussed plans for education. 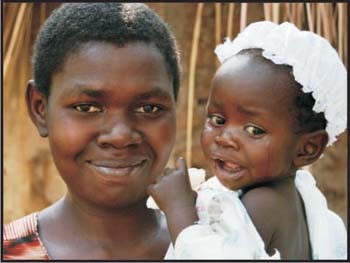 School fees in Uganda are prohibitively expensive, so majority of children leave school by the age of 12. 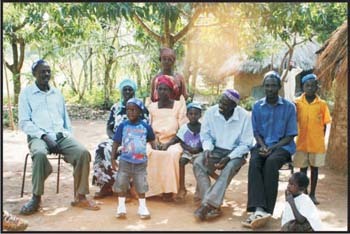 Yosef's community has no health facilities. If someone becomes sick they are taken by bicycle, over 50 kilometres, to the nearest clinic. One of the committee's long term hopes is that someone can qualify as a nurse and establishes a clinic in their community. Hygiene is also an issue - they have no running water and have to pay a neighbouring community for access to their bore hole. They have plans to use some of the profits from the pineapples to dig two community pit latrines near their synagogue. They also dream of completing their synagogue and want it to be a special place that they can be proud of. 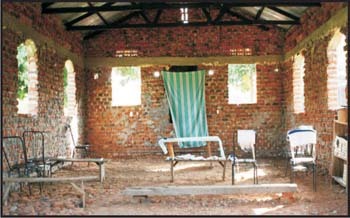 The remaining eight windows are yet to be glassed; a concrete floor laid; prayer books obtained; and a few more benches made so less of the congregation must sit on the floor during the service. 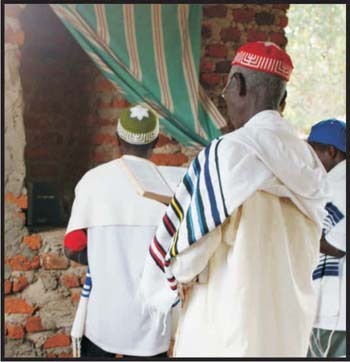 The community are passionately Jewish, they all have Hebrew names, and the men and boys wear their brightly coloured handmade kippot with pride. They pray and sing with excitement and great enthusiasm. While the community is happy to receive donations they have also stated that they want to work for their money and hope that the sale of their kippot might generate some income. Not only do they make unique gifts but the kippot can also be made to order for weddings and Barmitzvahs. The community can make them in any colours (including your favourite sports team! ), and any purchase goes a long way to contributing to the community's future. 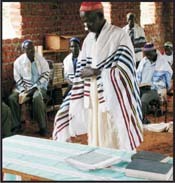 It would be a great way to connect this community in Uganda with other Jews around the world. If you are interested in donating to or purchasing kippot (prices from $6) from the Abayudaya or have any further questions then please contact Adam Williams at kippotforhope@gmail.com. 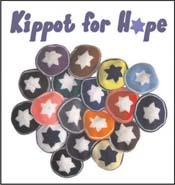 You can also join our Facebook group and become a fan of Kippot for Hope by searching for us on Facebook. The Shule from behind the Ark. The opening of the Ark.